Abraham Israel Pereira, Fernando Montezinos, George Lopes Telles and David Henriques Faro were all born in Villaflor in the 1588-1610 period. David's uncle Manuel (ref 216) was also from Villaflor as was at least part of the Coutinho family - with whom the Israel Pereiras had later links (see note 11 below). The chart indicates that the New Christian community of Villaflor was in part assembled from surrounding towns and villages - eg Mirandela, Pesqueira and in the case of the Baruch Lousadas - who must have been there to supply the wife who became the mother of Abraham Israel Pereira (see note 3) - Vinhais. Some details of the Henriques Faro family are unravelled in note 2 below; the (Henriques) Faro name suggests a link with the south, and thus it may be that not all the New Christians of Villaflor originated from Spanish and then Portuguese towns near the Duoro. Further, those from the south may even have been key to the formation of the New Christian society of Villaflor, as suggested by the ancestry of Fernando Montezinos (see note 7 below). Villaflor was not however the only Portuguese town in which the New Christians gathered together and thus reconstituted their community (see note 16 below). After Villaflor, Abraham Israel Pereira and Fernando Montezinos lived for decades as wealthy Portuguese New Christians in Madrid before making their respective escapes with fortunes more or less intact (see note 14). Some Baruch Lousadas appeared in Madrid, indicating that the Livorno and French Baruch Lousada dispersal also involved Madrid. The Henriques Faro trajectory, other than that family members appeared in Amsterdam and London, is even less known to us. In general it can be stated that not all family members participated in each move - typically families dispersed while retaining a local presence. Thus some descendants of Amador de Lousada lived on in Vinhais (see also note 10 below) but they too fell foul of the Coimbra Inquisition around 1650 and it seems some in the next generation made a hasty retreat to London in 1698 (Jacob #51 and his family); as apparently did Moses Henriques Faro who appeared in London in 1682 (see note 1 below). Fernando Montezinos after leaving Spain remained careful of his Seville New Christian merchant sons and died a New Christian in Antwerp, thus not joining his close Lopes Telles relatives as openly Jewish in the Protestant world. Lope Rodrigues Pereira of Villaflor was tried by the Spanish Inquisition (in 1637 - see note 12 below) no doubt prompting his probable close relative Tomas to leave Madrid in good time. In Amsterdam Tomas, or Abraham as he became, funded Jewish philanthropic causes in addition to commercial pursuits, but these causes included - unfortunately - the false Messiah Sabbatai Zevi (see note 15 below). His son Jacob also funded Jewish philanthropic causes (see note 17 below), having become a wealthy army supplier for Prince William of Orange (later William 3 of England), and lived opulently at Den Haag (see ref 297 p138). No doubt reflecting the New Christian society which flourished for a generation or two in Villaflor, Moses Baruch Lousada had 2 Henriques Faro marriages as discussed in notes 1 and 5 below. More strikingly, the will (ref 141) of Jacob Israel Pereira, eldest son of Abraham Israel Pereira, reveals multiple links with the Baruch Lousadas of Amsterdam, Den Haag and London. Thus his father Abraham Israel Pereira was a full cousin of Abraham Baruch Lousada #45 (see note 3 below). Jacob Israel Pereira was a full cousin of Abraham Henriques Faro (see note 4 below) undoubtedly the uncle who witnessed the marriage of Sarah Baruch Lousada a daughter of Moses Baruch Lousada (see note 5 below) for Sarah's mother Rachel was a niece of Jacob Israel Pereira (see note 5 below). The will makes bequests to the daughters of Moses Baruch Lousada and his brother Jacob #1388 (see note 5 below). And remarkably, the last wife of Jacob Israel Pereira was a Den Haag Louzada (see note 10 below) a family branch whose originator Abraham probably found a path to Amsterdam which was distinct from that via Livorno which was taken by at least some of his Baruch Lousada relatives. The chart includes all these links, though as the notes make clear, not all the specific links shown are equally as certain! 1. Moses Baruch Lousada had 2 sons - Abraham and Mordecai. Moses Henriques Faro was the uncle who witnessed the 1682 circumcision of Abraham's newborn son. This son was perhaps Moses #67 (not shown in the chart). That is, Moses Henriques Faro was the brother-in-law of Moses Baruch Lousada #46. Moses Henriques Faro was a 'forasteiro' or outsider (perhaps a newly-arrived Portuguese). References are given here. 2. Two Isaac Henriques Faros were cousins and had successive positions on Dotar (ref 151). The first Isaac (of course the one d1670 #1586) followed his father Abraham (d1658 #1175) on Dotar in 1660 and the 2nd Isaac (d1686 #1635) followed his cousin in 1671. Then the 2nd Isaac's son Abraham #1385 followed him onto Dotar in 1690. A 3rd Isaac d1719 had a father David (see burial record below) which we will see makes him a nephew of the 1st Dotar Isaac. The relationship between David Henriques Faro (see marriage and death record below) and Abraham Henriques Faro the elder can be gauged with the assistance of the 1659 will of Manuel Faro (ref 216) even though Abraham Henriques Faro who died in 1658 naturally does not appear in it. For Manuel Faro was an uncle of David and Isaac Henriques Faro, and though it is not completely known how he was related to them, notwithstanding much Amsterdam data linking the Israel Pereiras and the Henriques Faros (ref 217), he must have been an uncle by marriage and not a blood relative and the chart suggests a sister may have married Abraham Henriques Faro #1175 the father of David as well as of the 1st Dotar Isaac. Note 9 shows their marriages with David being father of both. There must have been another Henriques Faro brother as shown in the chart whose son Isaac became the 2nd Dotar Isaac. However this Isaac #1635 did not receive a bequest presumably because he was less closely related to Manuel Faro than were David and the 1st Isaac. A clue as to why ref 216 shows Abraham Israel Pereira was an uncle of Manuel Faro may lie in the fact that Manuel's last wife Lianor was a Gomes - albeit from Mirandela a town between Vinhais and Villaflor - and of course if Lianor was a niece of Beatriz Rodrigues Gomes then this would establish a nephew/uncle relationship between Manuel Faro and Abraham Israel Pereira. The chart suggests such a link. We note that Ines de Matos - mother of Beatriz Rodrigues Gomes - came from Pesqueira which is near Lamego to the south of the Duoro. 3. Ref 141 shows that Abraham Israel Pereira 1606-74 was a 'cousin germain' of Abraham Baruh Lousada meaning that a parent of each was a sibling. Abraham #45 who died in 1714 in London was a half/step-brother and probable cousin of Moses Baruch Lousada of London who died 1699 in London, Aaron #376 who died 1695 in Barbados, and Jacob #1388 who died in 1681 in Amsterdam; but probably a full brother of David #44 who died 1699 in Amsterdam aged 59 having been born in 1640 in Livorno. Prompted mainly by his year of death we take the birth of Abraham Baruch Lousada to have been after 1640. Therefore the 2 Abrahams must have been effectively born a generation apart, which suggests that Abraham Israel Pereira had a Baruch Lousada mother, though this inference is not certain (see note 13 below). We nevertheless set out to identify the parents of Abraham Israel Pereira, and this was achieved thanks to Fernando Gonzalez del Campo Roman - see ref 145 - so the Baruch Lousada mother was identified as Beatriz Geronima. Since on general grounds we believe Amador de Lousada was a Baruch Lousada ancestor, it is natural to conclude Amador's daughter Briatis was Beatriz Geronima (but the origin of the Geronima name is however a mystery for which we have suggested (see note 5) a possible explanation). Amador was from Vinhais, but was linked to many people named Rodrigues from nearby Braganza and the more distant Villaflor. Beatriz Geronima married the New Christian Antonio Rodrigues Pereira of Villaflor, and their son Tomas who married in Madrid became Abraham Israel Pereira of Amsterdam. 4. Ref 141 shows that Jacob Israel Pereira (son of Abraham Israel Pereira) was a 'cousin germain' of Abraham Henriques Faro. We also know that Isaac Henriques Faro (d1686 Amsterdam) married Rebecca Pereira (d1693 Amsterdam - see their death records below). Ignoring the Isaac/Rebecca pair considered in note 8 below, this supplies the relevant Amsterdam link between the families, so that Abraham Henriques Faro the cousin was the son of Isaac d1686. We note that there was an older Abraham Henriques Faro #1175 and a younger Abraham Henriques Faro #1632. Note 9 below provides confirmation that it was Abraham #1385 and not Abraham #1632 who was the 2nd Dotar Abraham (see note 2 above). 5. Moses Henriques Faro appears as a brother of the first wife (name unknown) of Moses Baruch Lousada (see note 1 above). Abraham Henriques Faro is an uncle of Sarah Baruch Lousada and who witnessed her 1709 wedding as shown in Amsterdam marriage data and is thus a brother of Moses' second (Henriques Faro) wife. Jacob Israel Pereira was a full cousin of Abraham Henriques Faro, who (see note 4 above) was son of the 2nd Dotar Isaac #1635. The closeness of the family links means that it is probable that Abraham #1385 was the uncle who witnessed Sarah's marriage. Abraham and Rachel must only have been half-siblings, for Rachel according to ref 141 was a niece of Jacob Israel Pereira and not described like Abraham as a full cousin. Therefore Rachel must have arisen from an earlier marriage of Isaac #1635 noting his last wife Rebecca Pereira died after him. We then considered (unsuccessfully - see note 18 below) the most obvious way in which Rachel could have been a niece of Jacob; thus it now appears that Rachel probably arose from a marriage of Isaac with a sibling-in-law of Jacob Israel Pereira (such a marriage will be difficult to find and we have not not yet done so; neither have we achieved the easier task of finding the Faro/Pereira marriage other than its reflection in the burial records below). In any event, it seems possible if not probable that Rachel was also the niece of (the first wife of) Moses Baruch Lousada himself (since both his spouses were Henriques Faros and his daughter Sarah appeared a generation after his sons Mordecai and Abraham). The daughters (including Sarah) of Moses #46 were to receive a bequest in Jacob's initial will. We are only aware of one such daughter (ie Sarah so her sister(s) perhaps died young - the London death records do not show this but certainly show a son b1686 died young). In any case this bequest was later revoked on 3 Feb 1704 in favour of Sarah's cousins the children of Jacob Baruch Lousada #1388, a brother of Moses. Of Jacob's 3 daughters, Simha and Rebecca did not marry. Perhaps Jacob Israel Pereira belatedly realised that the unmarried Amsterdam daughters of Jacob Baruch Lousada were of greater help to him in his old age than the much younger Sarah who was then in London. But perhaps he had already contributed to Sarah's dowry, though her marriage would have been long-planned if this was so for it occurred 5 years after the revocation! 6. Madrid data (ref 145) gives us the origin and marriage of Abraham Israel formerly Tomas Rodrigues Pereira and also the marriage of Fernando Montezinos making him a brother-in-law. 7. Note that ref 153 gives the Villaflor background of the ancestors of Fernando Montezinos going back to the expulsion from Spain of 1492. Using this reference we can also see that Pedro Lopes Telles was a brother of Fernando Montezinos and also Manuel Lopes Telles; the latter, also named Manuel Serra, spent periods in La Rochelle and Hamburg before he settled in Amsterdam in 1631 (but evidently appeared in Bayonne in 1633). But Pedro Lopes Telles was an uncle of George Lopes Telles, born in Villaflor in 1607 and hence George was probably the son of Manuel Lopes Telles and of course nephew of Fernando Montezinos. However we have yet to identify how they link with the later Levi Montezinos families. 8. Confusingly another Isaac Faro #1386 who died 20 Kislev 5431 (1670) married a Rebecca but this one is named Rebecca Simha. She did show the Pereira name but Isaac did not show the Henriques name. 9. Jacob's cousin 'germain' Abraham could not have been Abraham #1632 neither of whose parents met the requirement of being a sibling of one of Jacob's parents. Abraham #1632 is described as son of David in https://www.dutchjewry.org/P.I.G./image/00992301.jpg, while his brother Isaac is shown as son of David in https://www.dutchjewry.org/P.I.G./image/01014001.jpg. On the other hand Abraham #1835 married Esther Velozinos and had a marriage witness Isaac (who we take to be his father - though this witness is erroneously described as 'zuster' in https://www.dutchjewry.org/phpr/amsterdam/tim_sephard_marriages/amsterdam_tim_sephard_marriages_view.php?editid1=2511). The banns for the latter marriage may be found here. It can be seen that while the groom's witness is Isaac he is not stated to be the father - though as a young bridegroom with a father still alive it would not be surprising if the bridegroom's witness were the father. The bride's witness Rachel is stated to be a sister. 10. Based on our exploration of the descendants of Amador de Lousada, and because we now consider that the Den Haag Louzadas were close relative of the Baruch Lousadas, Sarah's father Isaac #50 (who married very young) appears to have been a cousin (once removed) of Jacob Israel Pereira. We suggest he was a grandson of Fernando (the 1st son of Amador de Lousada) who remained in Portugal. Perhaps the father of Isaac #50 travelled to Amsterdam via Venice (for the Den Haag Louzadas had Venice connections) as apparently did Abraham Israel Pereira. 11. 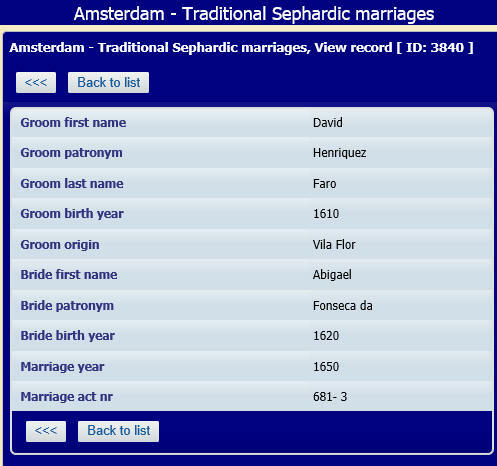 See http://www.dutchjewry.org/phpr/amsterdam/tim_sephard_marriages/amsterdam_tim_sephard_marriages_view.php?editid1=3675, where this marriage has a groom David Pereira b1614 Lisbon (who may not in fact be a Rodrigues/Israel Pereira) and a bride Rachel Coutinho of Villaflor. Manuel Faro of Villaflor (ref 216) gave a bequest to a Coutinho. See also http://digitarq.dgarq.gov.pt/details?id=2352194 for the Coimbra Inquisition record of Ana Pereira Coutinho from Villaflor. Jacob Coutinho entered the field of supplying the Dutch army but apparently not as successfully as Jacob Israel Pereira (see ref 297 p140). 12. Our distant relative Michael Waas found a 1637 Spanish Inquisition record of the trial of Lope Rodrigues Pereira. 13. In more recent times we note a case showing how large differences can arise in the case of children of male siblings. The birth-age range of the children of John Baruh Lousada #25 was 1833-54, while that of his brother Simeon Charles #74 was 1876-88. That is, an age-difference of such cousins of 55 years can be found. In this case John married in 1832 aged 22 and Simeon married in 1875 aged 51. Clearly age at marriage and difference in date of birth can have a big impact and need to be taken into account. These factors were considered in studying how the age difference between Abraham Baruch Lousada #45 and Abraham Israel Pereira may have come about in the context of our hypothesis - see here (scroll down to note 12). 14. An account of the Madrid life of Fernando Montezinos may be found in ref 123 p227, 222-3 where he is noted as leaving for Antwerp in 1657 after having been dealt with by the Cuenca Inquisition in 1656, while a brief account of the Madrid life of Tomas Rodrigues Pereira aka Abraham Israel Pereira may be found in ref 123 p230 where he is noted as having fled to Amsterdam in 1646 with disputed funds. 15. Perhaps this curious turn of events was linked to the discovery of 'lost tribes of Israel' in the region of present-day Colombia by Antonio de Luis Montezinos of Villaflor; he was also known as Aaron Levi (ref 8 pp195-211). Presumably he and Fernando Montezinos were members of the family who became known in Livorno and Amsterdam as Levi Montezinos (see note 7) and hence Abraham Israel Pereira (formerly Tomas Rodrigues Pereira) who was a brother-in-law of Fernando Montezinos (see chart and note 6) may have been a relative of the discoverer. The discovery set off Messianic excitement in the mid 1600s which no doubt enhanced Sabbatai Zevi's psychological impact on Amsterdam's Sephardic Jews! For an account of Sabbatai Zevi and his crypto-Jewish followers in the Ottoman Empire see ref 298. 16. Through analysis of Amsterdam records - especially marriage records - ref 297 shows there were a number of such towns in Portugal from which New Christians in effect gathered before departure. In its Table 2.3 covering Portuguese Jewish immigration to Amsterdam 1598-1699, Villaflor contributed 4 people which was exceeded by 13 towns, equalled by Faro, Guimares and Viana but was in excess of that provided by 27 towns. On page 99 we find the observation that those New Christians in Portugal not engaged in commerce had less information and fewer options to move away from Inquisitional interest. It seems that the availability of international links was a key factor in determining whether onward movement was to overseas destinations, to Spain, or merely within Portugal, and the Baruch Lousadas seem to have benefited by gaining international links through marriage. They thereby, in the cases relevant to us, made a transition from local tradesmen to international merchants! 17. Jacob Israel Pereira funded yeshivas as described in the following notes from Ton Tielen of 13 Apr 2019: The library Ets Haim, the oldest still functioning Jewish library in the world, holds a little brochure of a few dozen pages concerning the various legacies left by Jacob Israel Pereira. There were some gifts to Ets Haim in Amsterdam and to Aby Yetonim also in Amsterdam. The largest sum of money, however, went to two Yeshivas, Beth Yahacob in Jerusalem and Emet le Yahacob in Hebron. Jacob followed the footsteps of his father Abraham who also established two yeshivas in his name, in both Hebron and Jerusalem. In the brochure, you may find a business plan, a blueprint for the Yeshiva in Jerusalem. It looks like the same plan was intended for the Yeshiva in Hebron - but that one received only half as much money as the one in Jerusalem. The Ros of that Yeshiva was to be David Hisquiau da Silva who had made a great impression on Jacob Pereira when visiting Amsterdam as an emissary in 1691. Ros of the Yeshiva in Hebron would be Abraham Seeby. Both Yeshivas existed until well in the 20th century, yet remain largely unknown to a larger public; their history begs to be written. Ton Tielen noted that the brochure commands prayers to be said for Jacob's 2 wives Rebecca and Sarah ie that there was no intermediate wife as considered in note 18. 18. We noted that Jacob's first known wife was Rebecca de Paiva who was born in Seville in 1631 (see http://www.dutchjewry.org/phpr/amsterdam/tim_sephard_marriages/amsterdam_tim_sephard_marriages_view.php?editid1=3870), and who died in Amsterdam in 1667 (see http://www.dutchjewry.org/P.I.G./image/01990201.jpg). This left time before Jacob married his last wife Sarah Louzada (see note 10), who would not have come of age until the 1680s. Thus a 2nd wife could have been a young sister of Isaac Henriques Faro #1635 and thus a young aunt by marriage of Jacob, in which case Rachel could indeed be his niece. However this explanation has the fatal flaw recorded in note 17 above that there was no such intermediate wife.